Tottenham Hotspur will travel to Merseyside to begin their 2018/19 FA Cup journey with a clash against Tranmere Rovers. Spurs have reached the semi-finals of the FA Cup for the past two years but failed to reach the final on both occasions. Ahead of the trip to Tranmere, Mauricio Pochettino spoke to the media at Hotspur Way. Tottenham have a recent history of playing lower league opposition after facing AFC Wimbledon, Newport County and Rochdale last season. "Yes, Ossie and Ricky [Villa], we've spoken a lot about this competition of course. But always I told you in competitions like the FA Cup or Carabao Cup or Champions League or Europa League you need a little bit of luck." Spurs drew away to both Newport and Rochdale in the early stages of the FA Cup last season but won in the replay fixture. "Always we need some luck to win a trophy but we are going to try. Of course, that competition is one that excites the fans, it's an exciting competition. "Now I understand after six years it's such a magic competition. It's so nice to play the FA Cup because when you play that type of game, you feel it's a different game," he added. Christian Eriksen's future has been under scrutiny for a while now with the Dane one of the only players not to have signed a new deal. "To put in context, the question was some news about Eriksen? I said 'no news', then there was a period of silence, like a silence 'no news is good news'. I don't know if that's good news or not," he said. The Argentine manager was asked about the saga in his post-match press conference against Cardiff City and said "no news is good news'. "I’m not a person that suffers too much in this type of situation because football is dynamic. Football is about interests that as managers or head coaches we sometimes cannot manage. "It depends on many things in this business – different parties that have interests. 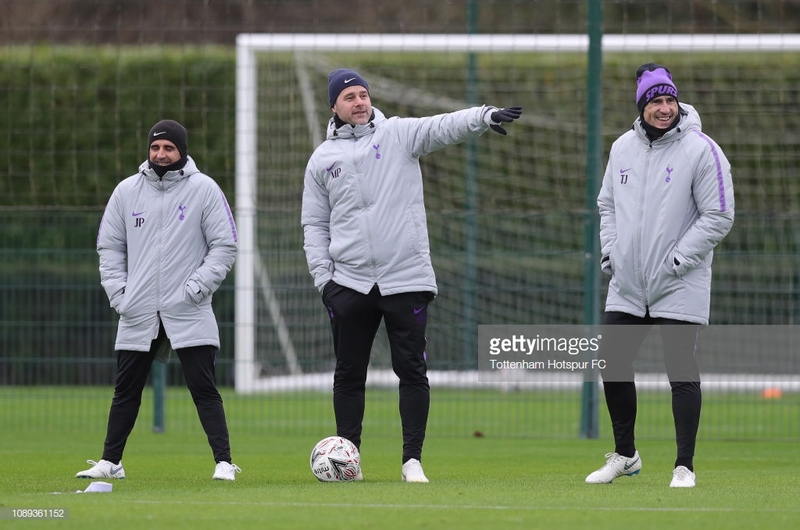 Of course, Christian Eriksen is such an important player for Tottenham and of course as a person or as a professional coach or manager, you would like to have this type of player with you," the 46-year-old added. Spurs failed to sign anyone in the 2018 summer transfer window and Pochettino was questioned to whether there will be any movement this time around. "The first time I heard [about] him was yesterday or before yesterday. I heard for the first time yesterday this name. It’s like many names that appear in the media - rumours," Pochettino said. The Hull forward has been heavily linked over the past week with a move to the north Londoners. "There’s many interested in this business. How many players are today in the media that are related with Tottenham, and have been in the past?"